It's crazy to even consider, but just mentioning the word "vaccination" on Facebook is sure to start a conflagration of differing ideas, opinions, accusations, junk science article shares, and mountains of anecdotal "evidence" as to why they're just the worst and/or cause autism in children. This is all in spite of the overwhelming majority of the world's doctors saying they don't. But there will always be the tin-foil hatters who share conspiracy theories about "big pharma" or whoever, pushing vaccines on our kids as a part of some inimical plot to protect us from diseases and bolster the human population by ensuring more members of our species survive childhood. And some doctors are done arguing with these people and have elected to not engage anti-vaxxers at all. They're also done treating them in their private practices. Many pediatricians are implementing new policies stipulating vaccinations are a precursor to being accepted as a patient. If your child isn't vaccinated, the doctor will refuse to treat your child. The reasoning behind their refusal isn't just personal preference, either: it's backed by the American Academy of Pediatrics. 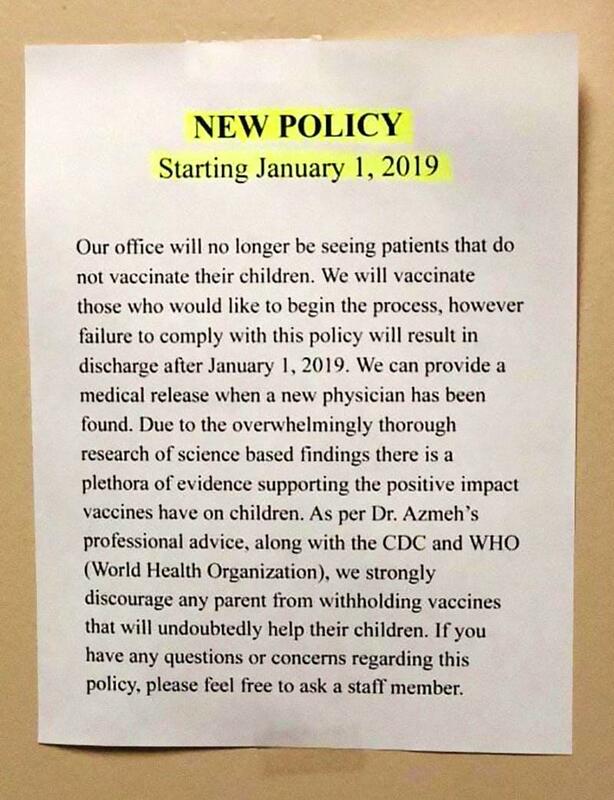 The note above is one such example: the doctor's office offers to provide vaccinations to patients who haven't had their shots; otherwise, they will be medically released to another physician who has no problem treating unvaccinated patients. The policy was implemented for a number of factors, all of them deeply rooted in undeniable evidence. Organizations like the C-D-friggin'-C (Center for Disease Control) and the World Health Organization, along with countless doctors and medical and healthcare professionals all over the world strongly advise patients vaccinate their children early on. Also, for pediatricians, unvaccinated children in their office post a health threat, even to vaccinated kids. One argument anti-vaxxers have is that vaccinated children shouldn't be at risk of diseases from unvaccinated kids because they're supposed to be "protected" from all infectious diseases, but that's based on an utter misunderstanding of how vaccines work. Young children, those with weaker immune systems that haven't been developed, children who are ill, and kids whose bodies haven't grown strong enough to combat certain illnesses are all at risk from children who carry infectious diseases. This article debunks the no-vax-shouldn't-hurt-vax argument perfectly. 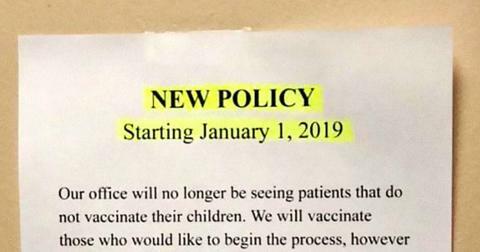 In addition to the doctor above, multiple healthcare professionals are implementing their own no-vax-no-service policies, and notifying patients' parents and guardians of the change. This note posted by Sunni Mariah hits a little closer to home, detailing the grim realities that some unvaccinated people inevitably face. 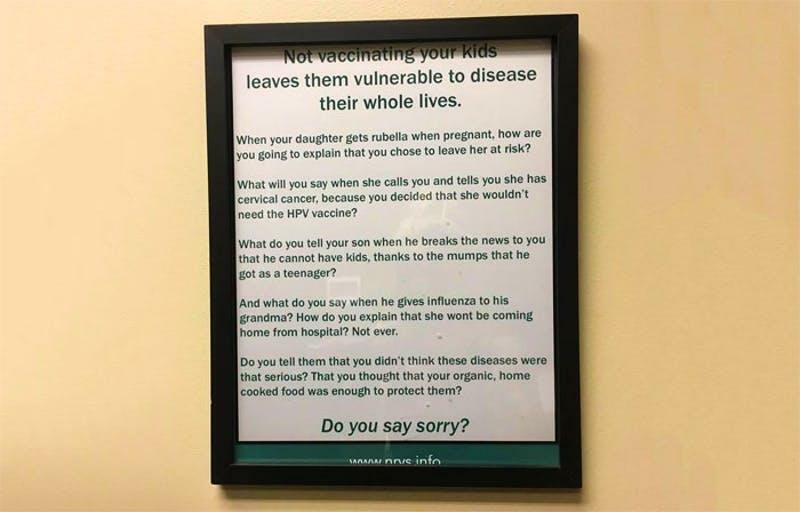 "Not vaccinating your kids leaves them vulnerable to disease their whole lives. What will you say when she calls you and tells you she has cervical cancer, because you decided that she wouldn't need the HPV vaccine? What do you tell your son when he breaks the news to you that he cannot have kids, thanks to the mumps that he got as a teeanger? And what do you say when he gives influenza to his grandma? How do you explain that she won't be coming home from the hospital? Not ever. Do you tell them that you didn't think these diseases were that serious? That you thought that your organic, home cooked food was enough to protect them? Damn, they didn't have to go as hard as they did, but they did. Perhaps the most important vote of confidence for this response to anti-vaxxers is a statement by the American Academy of Pediatrics. Forbes reported that the AAP has not once in its history supported doctors refusing to see patients, until now. "The decision to dismiss a family who continues to refuse immunization is not one that should be made lightly, nor should it be made without considering and respecting the reasons for the parents’ point of view. Nevertheless, the individual pediatrician may consider dismissal of families who refuse vaccination as an acceptable option." Despite the fact that trained professionals who have dedicated their lives to the study of infectious diseases are all in favor of vaccines, people will still believe public figures and individuals with no credentials who make baseless claims about vaccinations. There are several social media posts that break down just how harmful this belief is. 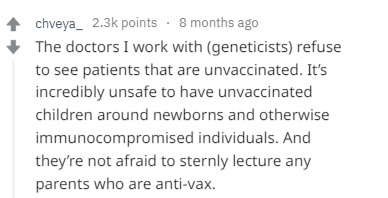 On Reddit, for example, there are tons of individuals who shared their own anti-vaxx stories or delineate by anti-vaxx arguments/logic are just bunk. Perhaps the most blatantly obvious argument against anyone who would have a problem with doctors not treating unvaccinated children came from one Redditor who pointed out how crazy it is for anti-vaxxers to still bring their children to the doctor. If they're against giving their children shots, then why would they listen to any other medical advice suggested by a doctor? There were others who mentioned, however, that this policy could have deleterious effects on children, ultimately. It might force parents with kooky medical beliefs to turn to alternative "medicine" to heal their children when they're sick. And, of course, there were tons of people all too ready and willing to make some anti-vaxx jokes. What do you think about the policy? Will it force parents who are staunchly against vaccinating their kids to finally wake up and smell the coffee? Or will it just push them away to more dangerous and unproven "treatment" methods and ultimately result in them contributing the deterioration, or sadly deaths, of their own children?